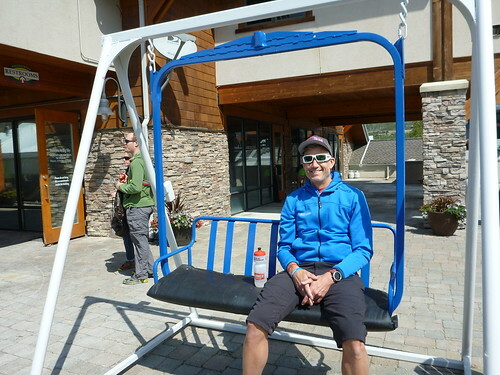 Wow, check another item off of Martin's bucket list, the Lone Peak Vertical Kilometer was incredible. 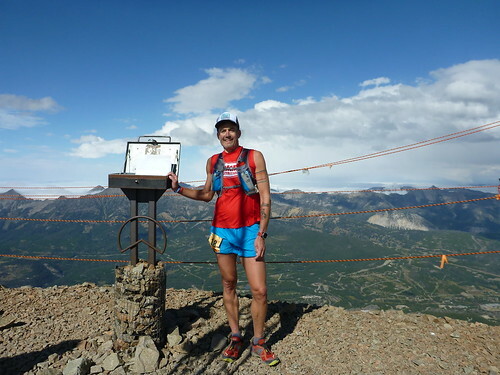 A Vertical Kilometer (or VK for short) race is a Skyrunning event and as such has specific criteria. 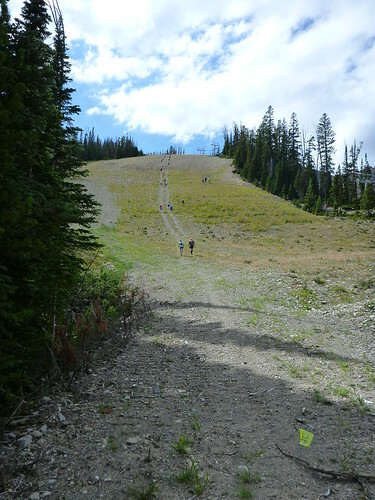 In a nutshell you need to start above 6,000' and then you need to go up for at least 3,000' more in no more than 5k. You get the idea, this makes for some steep climbing. And Big Sky didn't disappoint! 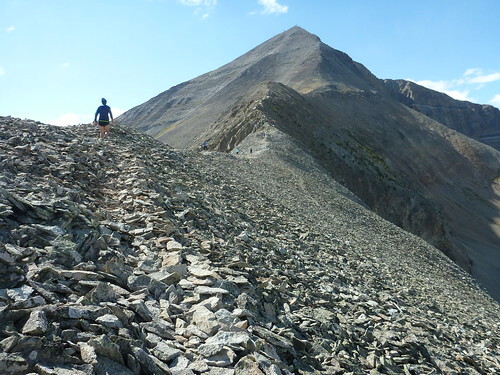 The base of the ski areas is at roughly 7,200' and the top of Lone Peak is at 11,166'. Total distance? Just a 5k. Go! 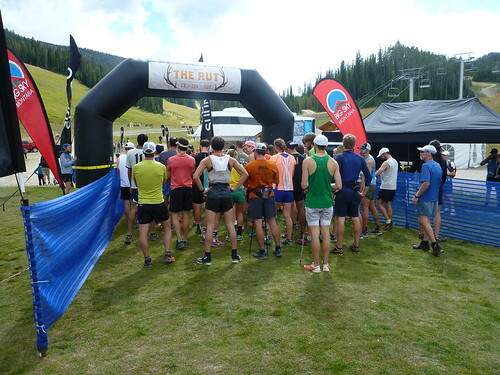 The start of this race was at 3:00 PM which you might think is awesome but for me it just means more milling around aimlessly and worrying about whether or not I should eat. Luckily it was a great day and so I took pictures. Here is the start before all the pomp and circumstance. 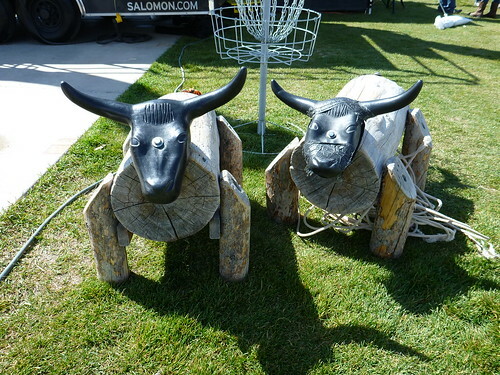 Here is some very Montanaesque art. Here I am trying to soak in the sun. At one point I went and got my race numbers at packet pick-up. And then eventually it came time to get on my running clothes and pretend to warm up. Truth be told, I actually did warm up. I dumped my vest and jogged up one of the dirt roads. After what felt like about .125 miles I was completely winded and walking so faked it a little more and turned around. Living at sea level does take its toll. 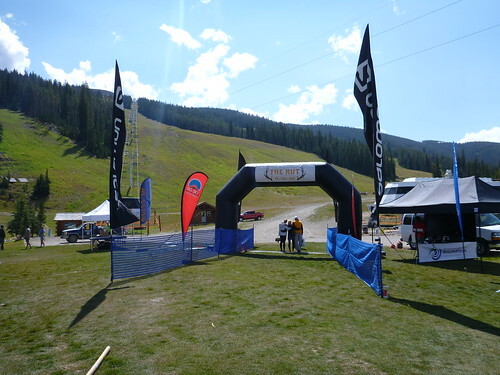 Although the sky was blue weather here changes in a heartbeat and the organizers let you send a drop bag to the top of the course. I stuffed about three layers into my bag and I am oh so glad I did. Thank you race organizers! Looking around most people were traveling uber light. Not only did 99% of the competitors not wear a vest/pack, pretty much no one had a handheld bottle and several guys went shirtless. 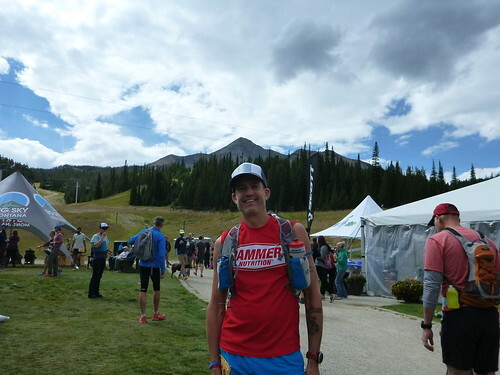 Since I figured I was not going to crush much of anything and since my mouth gets pretty dry and since we were at elevation and since I thought I would need my hands for the upcoming scramble I wore my Ultimate Direction SJ Ultra Vest 2.0 to carry a bottle. And since I had the vest on, I also took my camera. ASIDE - I laugh now thinking that I actually took pictures on a 5k race! But I'm pretty used to it and it didn't slow me down very much. I did hear one person at the top exclaim as I approached the finish, "Ha! That guy is filming us!" Indeed I was. Here is the start of the first wave. These guys are running! They sent us off in waves and you could self-seed so I selected wave 3/4. And then it was time to pack the chute. And then we were off. 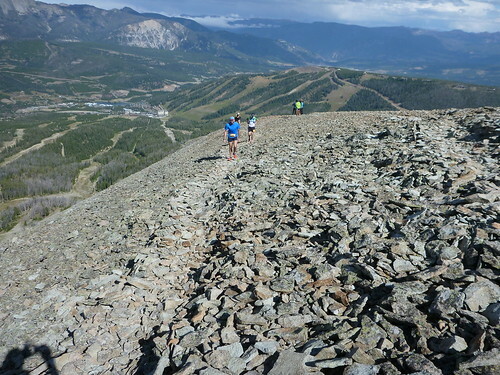 The first part of the climb is right up a bunch of ski runs so it does have some 'stairs' (read: flatter spots) and I learned very quickly that the key was not to push the climbs so hard or you would blow and not be able to run the flats. 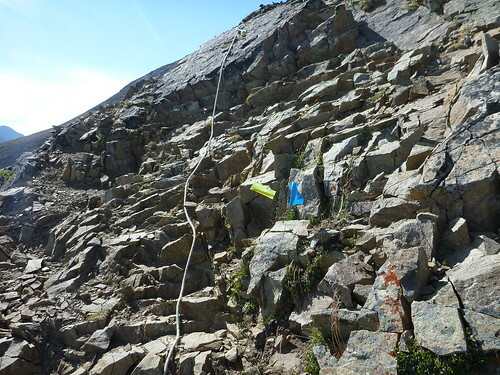 Even though we were not even on the 'hard' part yet, these pitches were steep! 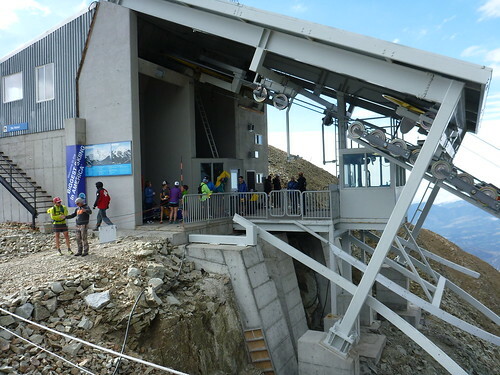 After 3 km you get to the start of the Lone Peak climb and from here you gain over 2,000' in just under 2 km. You literally take the most direct path up a ridge to the very top. Yikes! Here I am crossing the road at the end of the ski run just before you head up the Lone Peak ridge trail. How fast was I going up here? I'm guessing maybe one mile per hour... There was no actual climbing where you had to use your hands to pull yourself up but there were many places where I had to use my hands to grab the rock to steady myself so that I wouldn't fall down the slope. Like I said, awesome! So awesome that I had to stop half way up this ridge and take a picture looking back down. I think a lot of people thought I was crazy for packing a camera. Here we are, wheezing and gasping for breath and I'm taking pictures. At least I didn't obstruct anyone in the process. At first the slope was not insane and there were even a couple of sections I could run. Briefly. Finally, after some seriously insane sections, we got to the top. And I ran across the finish. 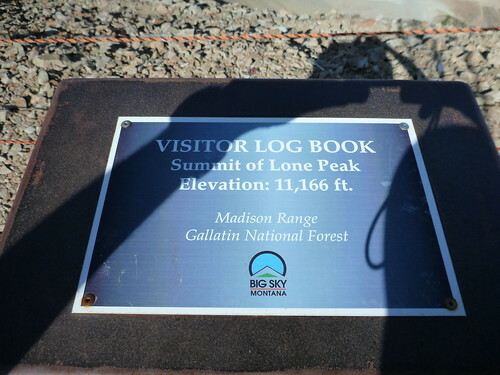 I caught my breath and then walked the extra 50' to the physical summit of Lone Peak and entered my name in the log book. Then it was time for the Seattle contingent to take some group photos. 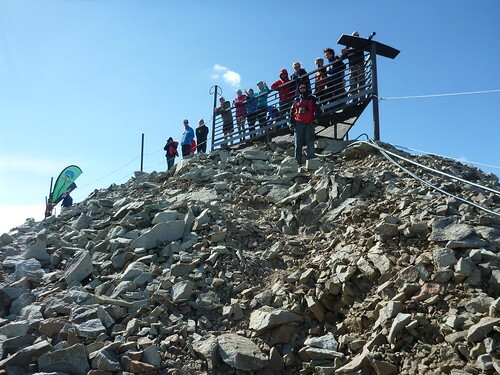 And then it was time to explore and enjoy this summit! Have I said how fortunate we were to have good weather...? Oh MAN this would have sucked if it wasn't nice out. Still, the wind was fierce up here and I was so thankful for every layer that I had in my drop bag. ASIDE - like the giant conformist that I am, I bought a trucker hat at packet pick-up and wore it for the first time on this run. 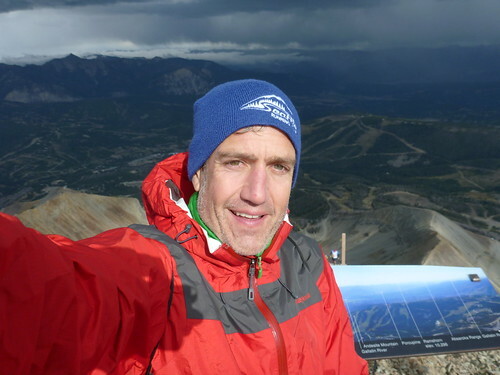 The visor was great to have but the wind was so strong that I had to stop half way up the Lone Peak ridge and tighten my hat so it wouldn't fly off my head. Up on this peak you are out there. In this picture you can see where we climbed up right behind the map. 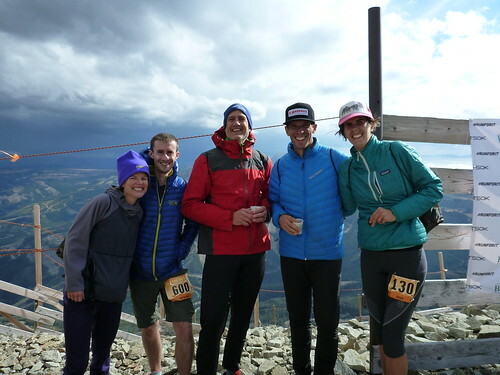 In order to not impede other runners (and for our own safety no doubt) we had to take the tram down, run/walk a bit to another chairlift, and this one took us right back to the Big Sky Resort village. That was a nice way to end the day. And what a day it was. Pretty sure I had a beer after. I was (but shouldn't have been) surprised to discover how important pacing is even in a one hour event. People were leaving me behind like crazy at the start but I found my pace and caught and passed all but one person in my wave. I also caught and passed several people in the wave in front of me. Interestingly, I passed quite a few folks in the last 2 km. I credit my time on the Howe Street stairs for that. :) Mind you, there was very little accelerating, I was reduced to just one gear on this monster. Thanks so Hammer Nutrition for the perfect fuel, Brooks for the perfect shoes (and shorts), The Balanced Athlete for all the support not only to me but also to the Seattle Running Club throughout the year and to Shelley for encouraging me make this trip (that was pretty selfish since she could not come and not super cheap). Here are all my pictures and videos. What a fun event! I need to put this on my list as this is my type of race. Looks like you finished right about the same time as my 17 year old friend and I think he started in your wave. Young and Old - you guys inspire.